you can feel the faint scent of hinoki! 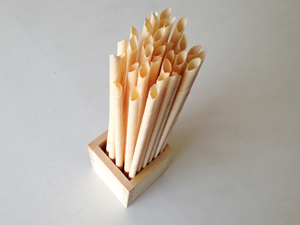 These are scent sticks made of hinoki. Very popular items as aromatic decoration! The material that we use for the masu cups is Hinoki, it is also called Japanese Cypress. Beside Sugi(Japanese Cedar), Hinoki is also the main representative of Japanese trees, but Hinoki is generally considered to be more valuable than Sugi. Hinoki has such a characteristic fragrance that it will make you feel highly relaxed as if walking peacefully in a forest when you feel it. The timber of Hinoki is so highly prized that it's said to be "Selling by the scent"! Its high quality timber has been used for creating wood products and as a building material for houses. This is where the saying "Smells so good as a newly constructed building" has originated from. Being fast drying, antibacterial and highly durable are also important characteristics that increase the value of Hinoki. All these characteristics make Hinoki perfect material for hot spring baths, table tennis rackets, taiko drum sticks(bachi) and the list goes on. The scent of masu makes it a perfect vessel for drinking taru sake. 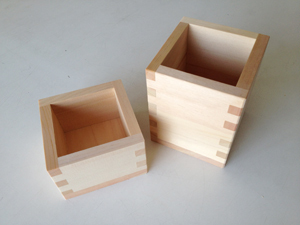 Hinoki masu cups have always been used on Kagami biraki ceremonies for serving sake. Picture masu Choose any of our fixed branding designs! Popular Character Masu Choose any of our fixed branding designs!